It’s not uncommon for businesses today to use social networks – namely, Twitter and Facebook – as a platform for engaging with customers and managing customer relationships. This development has given rise to an increasing number of social media solutions and dashboards, each promising to streamline all tasks and bring a new level of ease in customer engagement. Let’s take a look at the best of these solutions and their features. MediaFunnel is a social media suite for businesses and enterprises, with a host of features designed to make Twitter and Facebook accounts easier to manage. One of these distinguishing features is Multiple User Roles, or the ability to assign Administrator, Publisher, and Contributor roles and grant various levels of permission to review or publish tweets and Facebook posts (for greater editorial control and efficiency). Apart from monitoring Twitter and Facebook for mentions and tracking the performance of links via Bit.ly and BudURL, MediaFunnel also enables you to create content for future use (or future publication), schedule tweets, and assign tweets to other team members for follow up. A free MediaFunnel plan allows two users and two social media channels. An upgrade to the Standard Plan provides all MediaFunnel enhancements and features for an unlimited number of users and channels (Twitter / Facebook accounts). Available as a downloadable desktop application with data stored in the cloud (for multiple user access), MarketMeSuite also features ZenDesk integration, allowing you to turn tweets into customer support ticket (“twicket”). 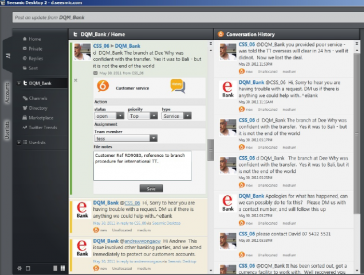 Customer issues found on Twitter can also be organized into Dotted Tweets, which enables you to assign tweets to other team members and MarketMeSuite users – and make sure that each twicket is solved. MarketMeSuite gives the ability to add an unlimited number of Twitter and Facebook accounts, as well as an unlimited number of team members. Pricing is fixed at $5.99 a month; you can also sign up for a year for $34.99. Seesmic is a suite of social media management freeware for businesses and individuals, available on the Web as an online tool, across mobile platforms (iPhone, Android, Blackberry, and Windows Phone 7), and as a desktop application. The browser-based Seesmic (Seesmic for Web) offers support for multiple Twitter, Facebook, LinkedIn, Salesforce Chatter, Foursquare, and Google Buzz accounts by default. 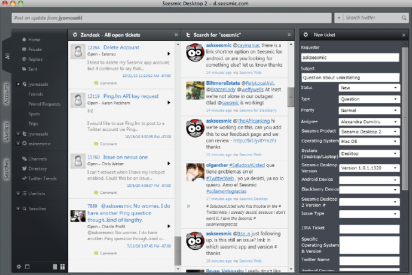 The Seesmic mobile products, meanwhile, natively support multiple social networks, such as Twitter, Facebook, and Ping.fm. With 6DGREE for Seesmic Desktop, you can review conversations according to priority or outstanding status, then assign these to service agents or team members. 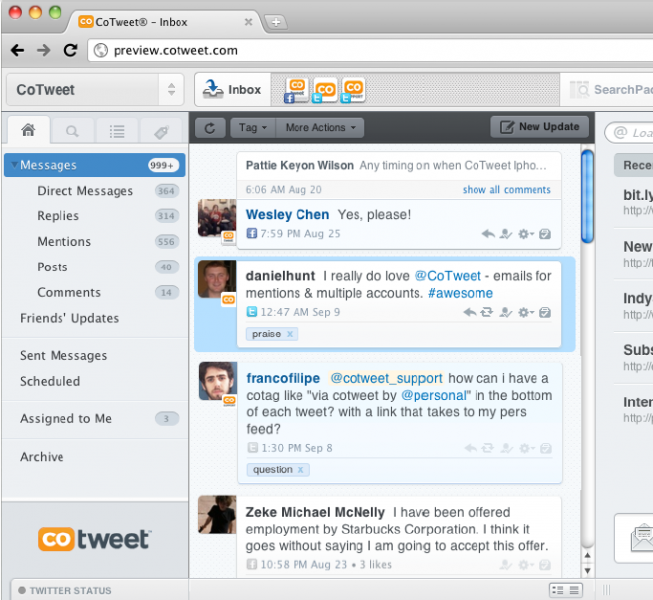 It supports companies with multiple Twitter and Facebook accounts, too. Because the plugin records your status and file notes, you also gain access to a full history of conversations between your brand and your customers. Support for Formspring, Klout, Ning, Google Reader, Gowalla, Visibli Analytics, BrandWatch, etc. CoTweet, another social media solution, focuses on customer engagement and is designed to help companies manage, track, and analyze real-time conversations about their brands on Twitter and Facebook. Instead of serving as a desktop client, it is accessed through a Web browser. CoTweet also has a unique OnDuty Status feature, which assigns responsibility to a team member for monitoring social streams at a certain time. The person on duty can then receive E-mail notifications containing the latest mentions of the brand in social media. Facebook and Twitter), workgroups (with advanced roles and permissions), more analytics, advance scheduling capabilities, mobile apps, and third-party integrations (including Salesforce.com and TwitPic). I find this post so interesting! These sites are very useful especially in business. I’ll probably try the CoTweet site because it seems fun to use as a tool to respond to other people. All of these dashboards have good features. I want to try all of these. It will make it easier for me to manage my accounts on both Facebook and Twitter. I want to try CoTweet. I normally tweet everything whenever I play online games. It’s for my friends to know what on earth I am doing right now.